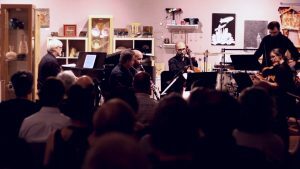 No Exit returns to Heights Arts to present the second installment of their Cleveland composers series of concerts. The program will feature all-new world premiere works by Keith Fitch, Buck McDaniel, Chris Auerbach-Brown, Nasim Khourassani and Greg D’Alessio. Be sure not to miss this evening of captivating sounds by some of Northeast Ohio’s most talented composers.